Standard, Half Standard & Bush Apple Trees available for planting now. My advisory business will continue and the rates are £200/visit + travel expenses. Please do not hesitate to get in touch if you would like me to visit to discuss your orchard. click here for the full planting demonstration video! 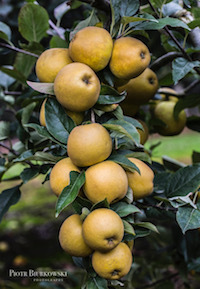 We specialise in cider apple and perry pear trees, offering a large selection of first class trees of exceptional value and of interest to the artisan or craft cider-maker as well as varieties for the grower supplying the larger cider companies. The trees are grown on our own nurseries in Herefordshire, with propagating material personally selected by John Worle, and using a wide range of rootstocks to suit all conditions. In the first year we plant certified rootstocks in virgin ground in order to produce the best trees, these are then budded with the chosen varierties in the summer. We cut the stocks back to the bud in late February, growing the trees on with care and attention to detail during the second growing season and by the end of November have the final, well feathered, maiden tree ready for you to plant and begin to crop from the second year. Bush trees can be supplied on MM106, MM111 and M25 rootstocks. Standard and Half Standard are grown on M25 rootstocks with an appropriate stem-builder. Bush perry pears are budded onto pyrus c. Kirchensaller seedlings especially chosen to suit growing conditions in the UK. We are happy to propagate special orders in large or small numbers and can advise on the most suitable varieties to meet your requirements. John has over fifty years' experience in nursery work and apple production and can offer practical on-going orchard management advice.